The badge earner has a proven expertise to scan and test web applications for the identification and analysis of vulnerabilities and attacks, using IBM AppScan Standard. The badge earner has demonstrated advanced proficiency on topics such as OWASP web application security standards, SQL injection flaws, authentication, cross-site scripting, sensitive data exposure, and Glass box scanning. Completion of Module I - Cyber Security Overview: Covering Security Overview, Trends, Case Studies; Security standards and frameworks. 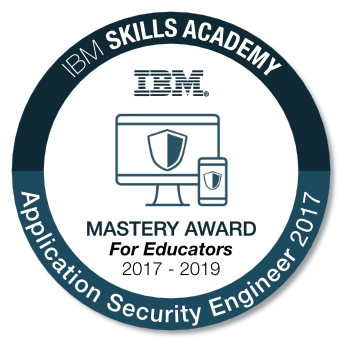 Passing the IBM Proctored Exam for "Application Security Engineer 2017".